You will find the best prices for Ink and Toner at My Computer Store. 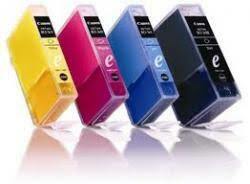 We can order all types and brands of ink cartridges and toners but we specialize in re-manufactured cartridges. Save 30-60% off the cost of brand names! We are so confident in our products that we guarantee them for the life of the cartridge. If one ever fails we will promptly replace it! All cartridges are thoroughly inspected and taken apart and checked for worn parts. Worn parts are then replaced and each cartridge is filled with high quality graphics toner and reassembled. Many people don't realize that some cartridges that are sold as new are actually re-manufactured. Take a look at your cartridge box. If it says anything like, 'the cartridge may contain reconditioned parts', you are paying too much for what is actually a recycled cartridge in fancy packaging. Our cartridges are manufactured under ISO 9001 standards by Certech. For a free, no-obligation quote contact us today! Why should I buy a re-manufactured cartridge instead of a new one? You can save 30-60% off the cost of brand name . Look at the bottom or side of your box. Some say "Made in Japan from the highest quality new and recycled materials" while others state "this newly manufactured product may contain parts and materials recovered from the HP Planet Partners Recycling Program" or Canon's "This cartridge may contain reconditioned parts". You're probably paying too much for what is actually a "recycled" cartridge put back into fancy packaging. I've heard some horror stories about recycled cartridges. So have we! Those people are called drillers and fillers. They open the cartridge, fill it up and sell it. Drillers and fillers gave the re-manufacturing industry a bad name and we are working hard to overcome that. Ask questions before you buy whether it be from us or any other re-manufacturer. What do you do that is different from a driller and filler? All cartridges are thoroughly inspected, then taken apart and checked for any worn parts. If any are found, they are replaced. Each cartridge is then filled with high quality graphics toner and reassembled. Before each cartridge is packaged, it is then tested to make sure that it meets our high quality standards. What kind of guarantee do you have? Glad you asked that. Some manufacturers and re-manufacturers only offer a short-term guarantee. We are so confident in our products that we guarantee them for the life of the cartridge .However if one of our cartridges fails, we will promptly replace it. Where are your cartridges manufactured? Our cartridges are manufactured here in Ontario and in China under ISO 9001 standard by Certech.